Serenity Farm Equine Sanctuary (SFES) is a Virginia Non-Stock Corporation501C3. We incorporated on May 27, 2016, and filed for non-profit status with the IRS on May 31, 2016. 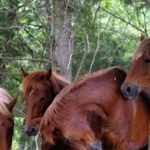 While there are many organizations in the state that are involved in equine rescue, there is critical need that has come to our attention while assisting Virginia Rescue Organizations. During the past year, we have added 6 pastures, 3 in ground Nelson waterers, developed a volunteer program and Verified through GFAS. We’ve retrained 4 horses and are working on 4 more. We’ve had 3 successful adoptions. We’re working on GFAS Accreditation next and a barn extension. View Accreditation Press Release here.